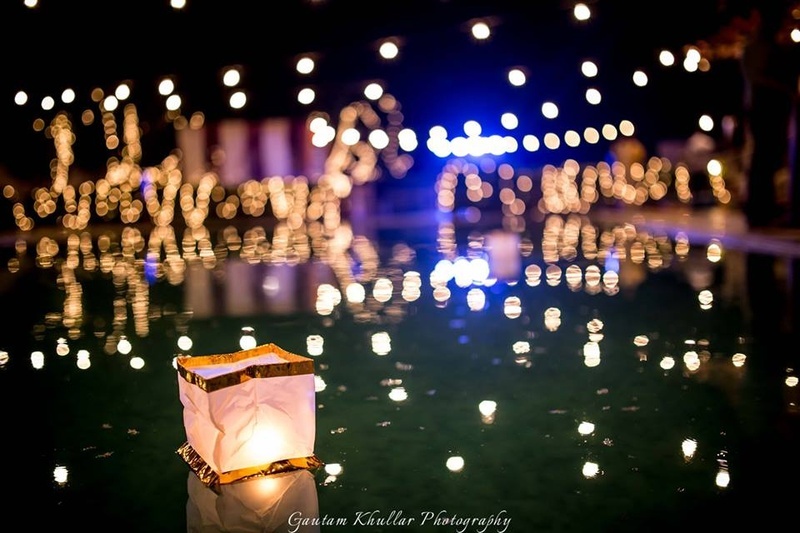 Everything about this wedding spells out LOVE in big and bold. 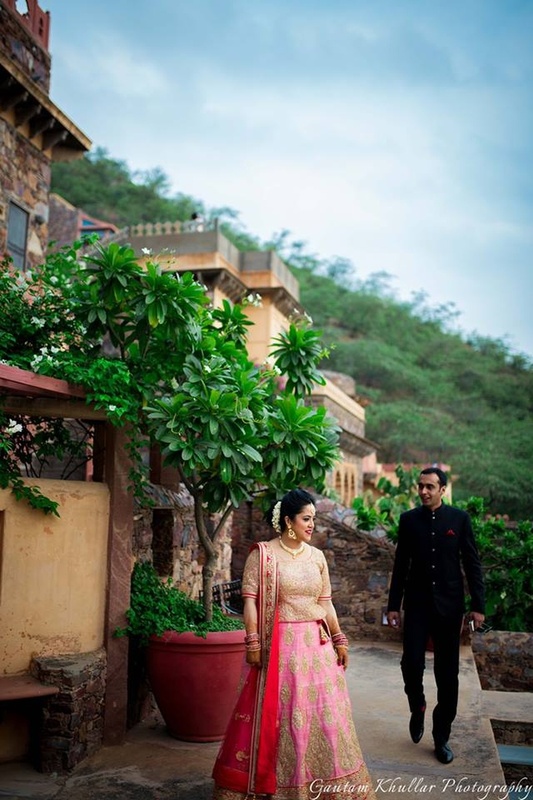 Moumita and Sriraj's wedding held at the Neemrana Fort Palace Jaipur sets wedding goals way high. 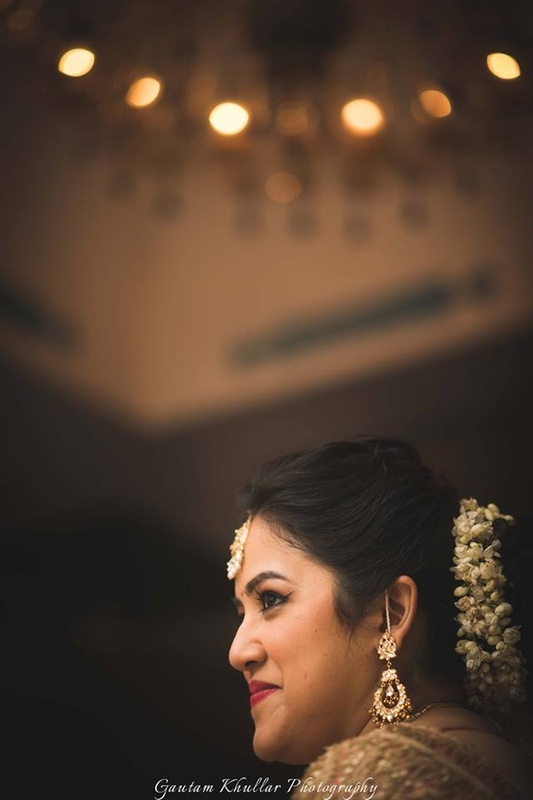 The highlights? 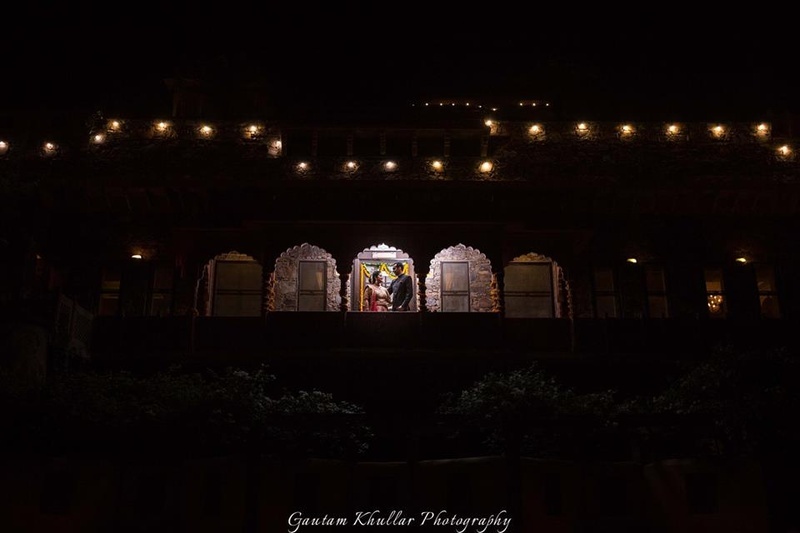 A stunning night time mehendi ceremony, quite a shift from the daytime affairs that we've been seeing lately, not to mention her royal blue and mustard yellow brocade outfit, a heart warming haldi function, a full on sangeet party with the usual bonhomie, her stunning pink lehenga, Neemrana fort palace all lit up in fairy lights and some out of this world wedding photography by master craftsman Gautam Khullar. 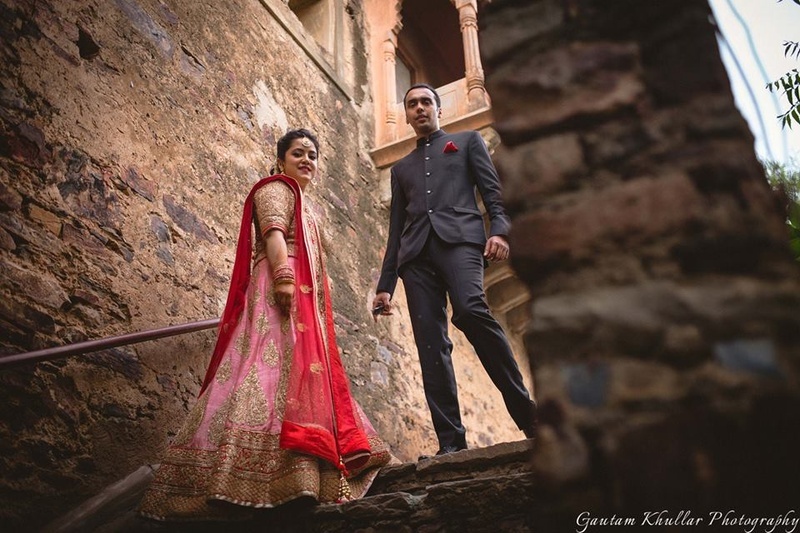 Everything about this wedding spells out LOVE in big and bold. 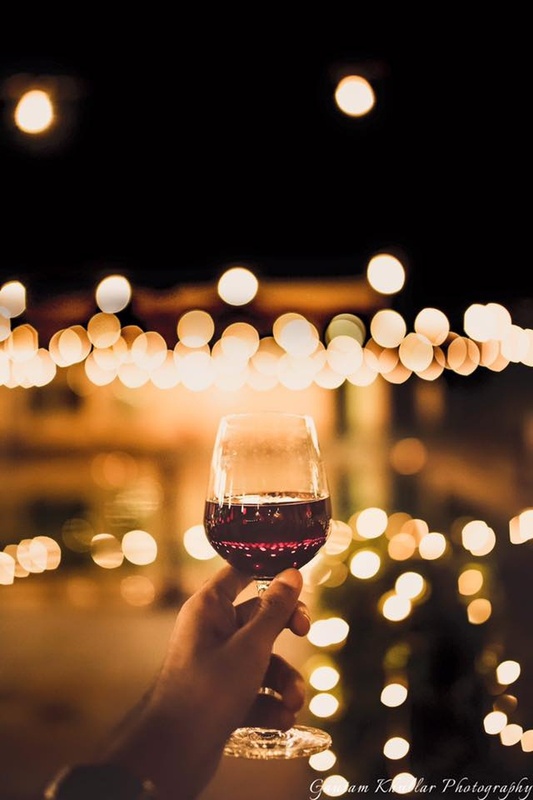 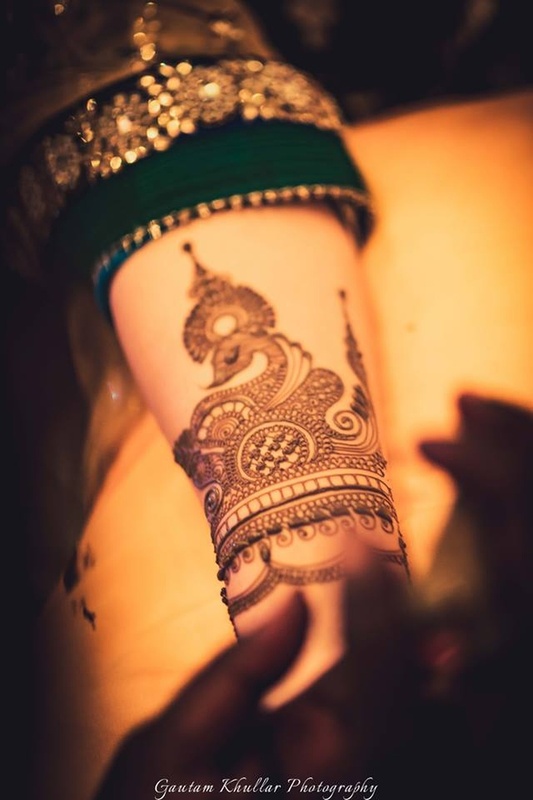 Scroll along to look at the fabulous pictures. 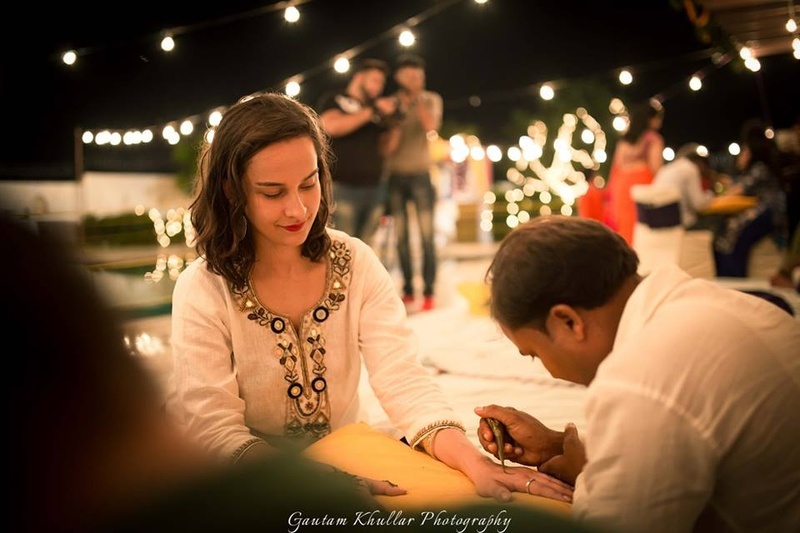 Beautiful mehendi by mehendi artist Raju Mehendiwala, Gurgaon. 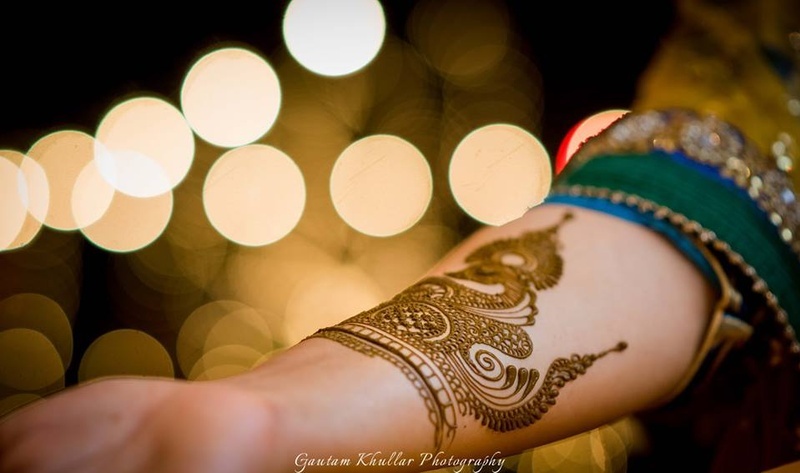 Hands covered with intricate bridal mehendi designs. 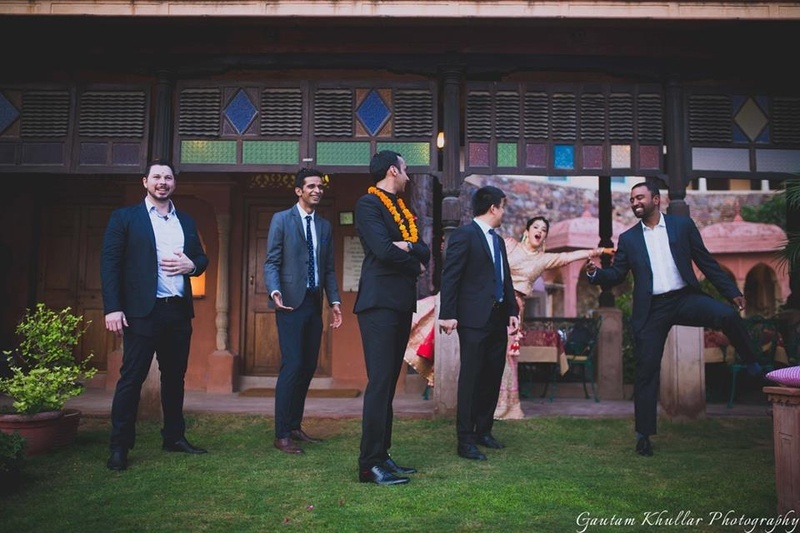 Mehendi ceremony held at beautiful Neemrana Fort Palace. 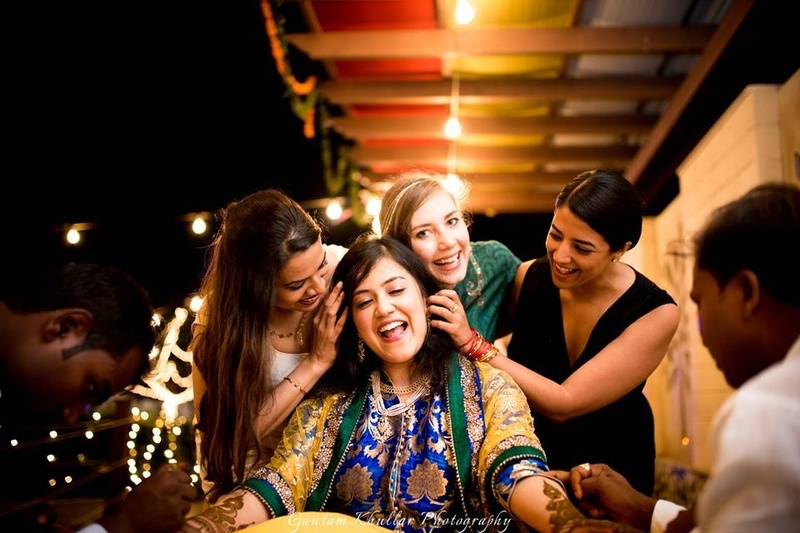 Moumita wearing royal blue brocade kurta paired with yellow and green net dupatta styled with minimal pearl jewellery for the mehendi ceremony. 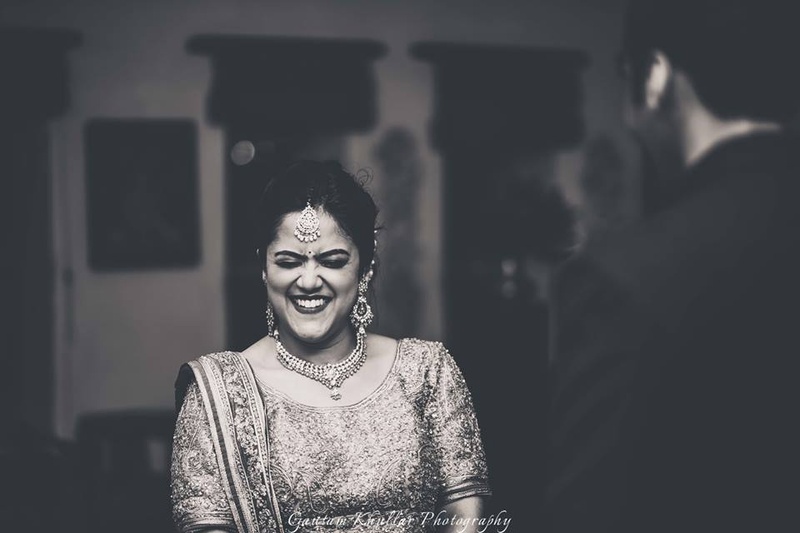 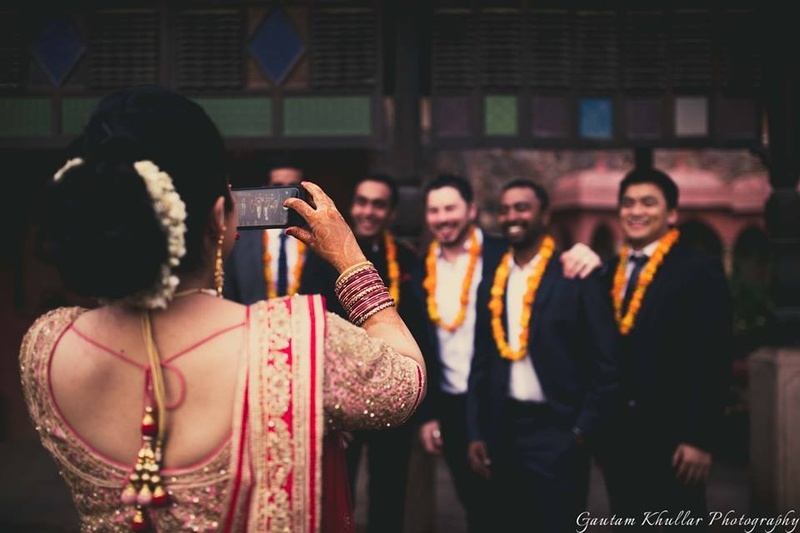 A very beautiful bride and bridesmiads picture shot by Gautam Khullar. 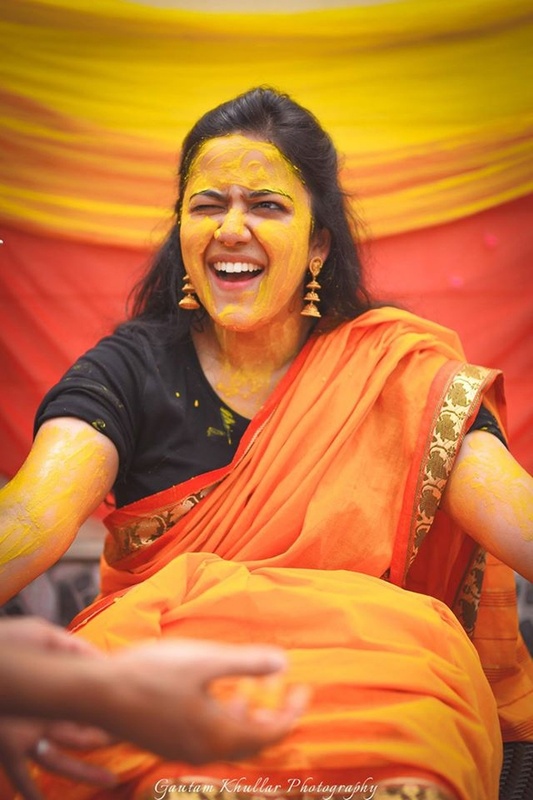 Feet covered in haldi paste for haldi ceremony. 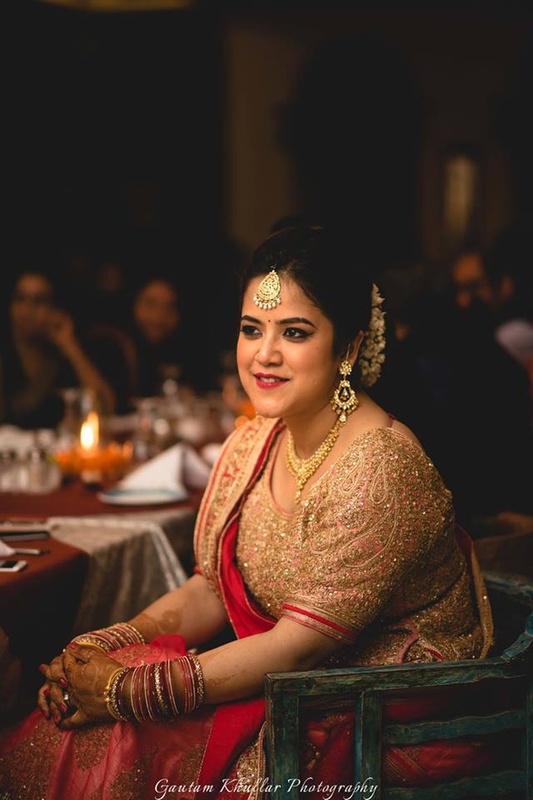 Wearing orange saree paired with black blouse for the Haldi ceremony held at Neemrana Fort Palace. 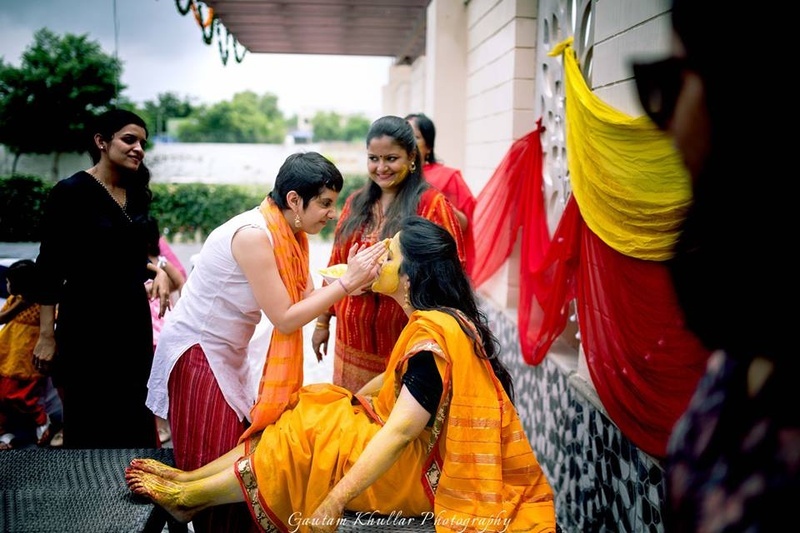 Applying haldi to the bride. 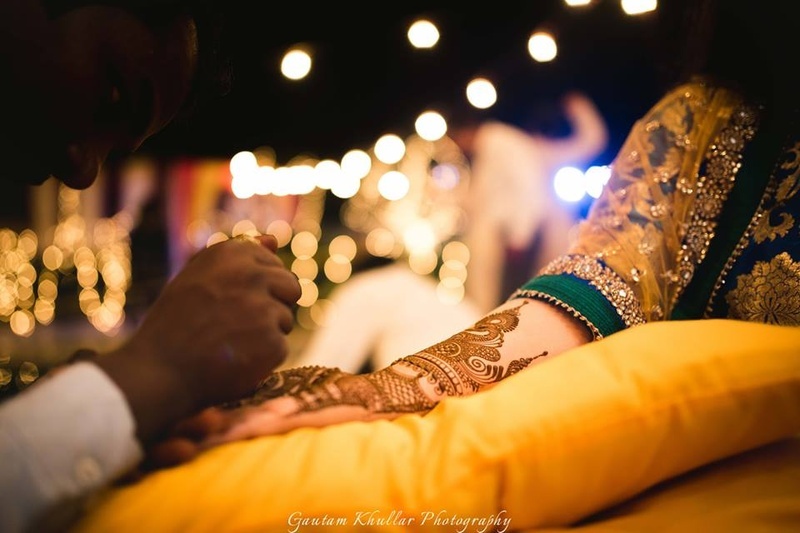 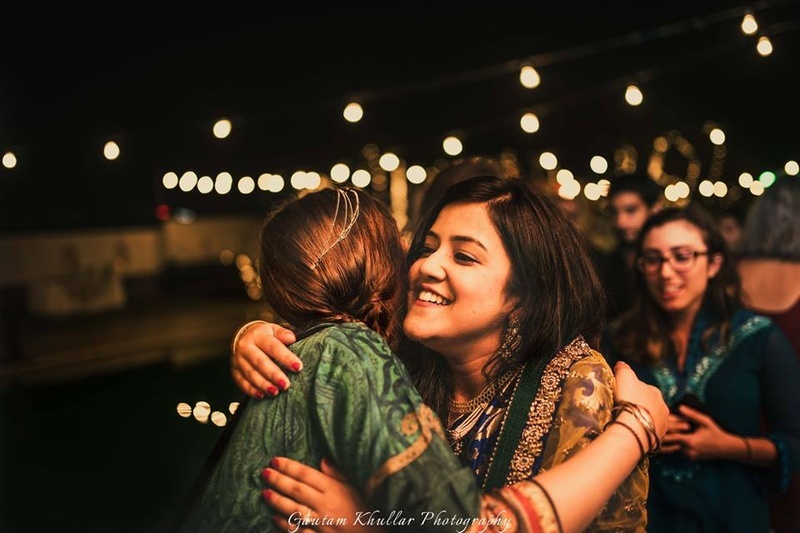 Candid haldi ceremony capture by Gautam Khullar. 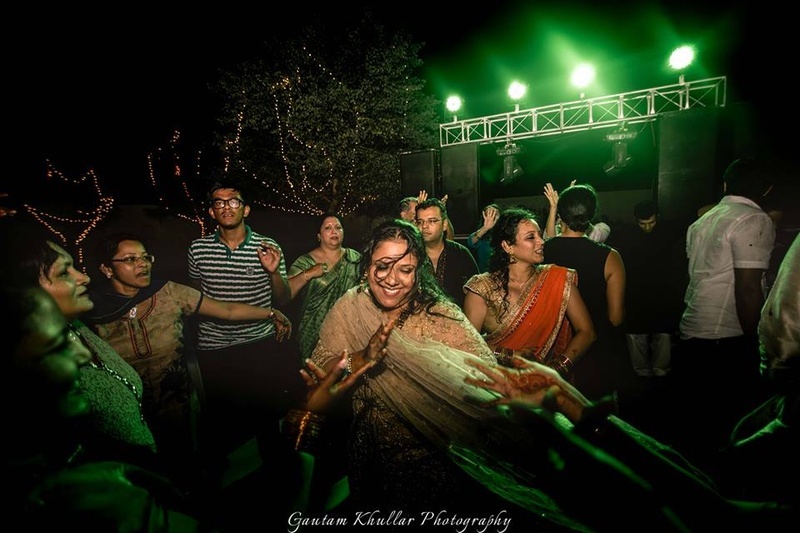 Guests dancing at the sangeet ceremony. 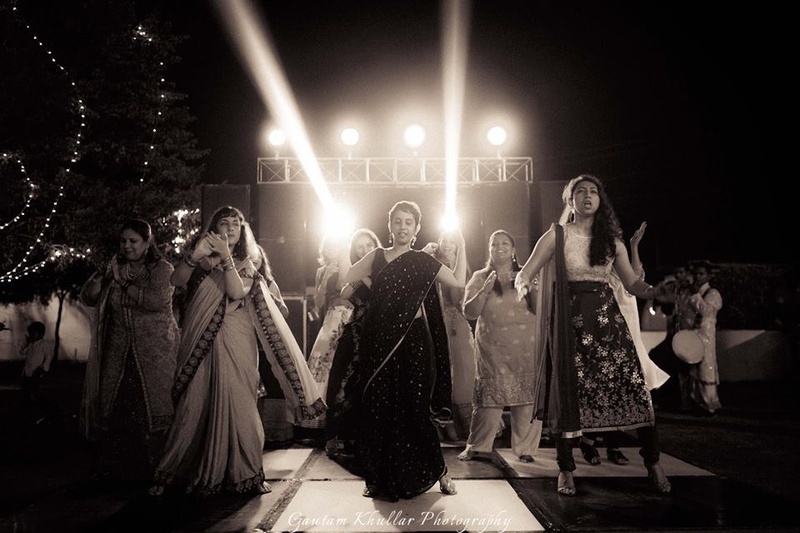 Dance performance by bridesmaids at the sangeet ceremony held at Treehouse resorts, Neemrana. 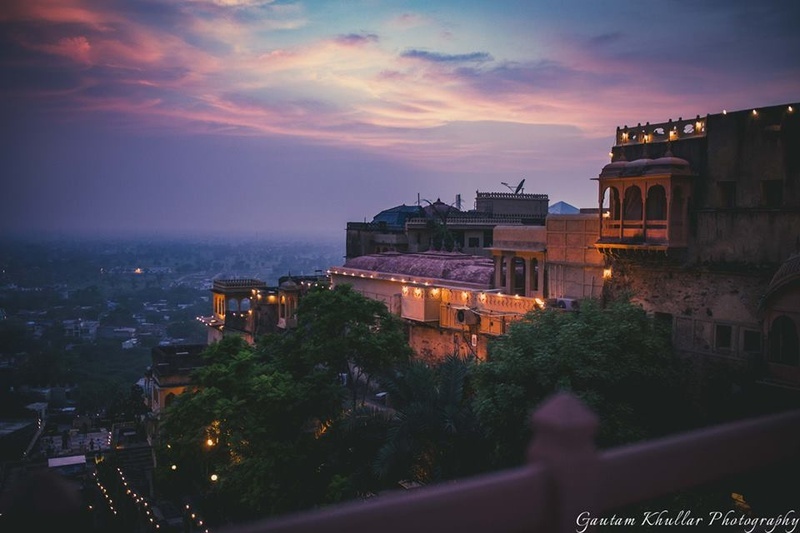 Beautiful Neemrana Fort Palace photography by Gautam Khullar. 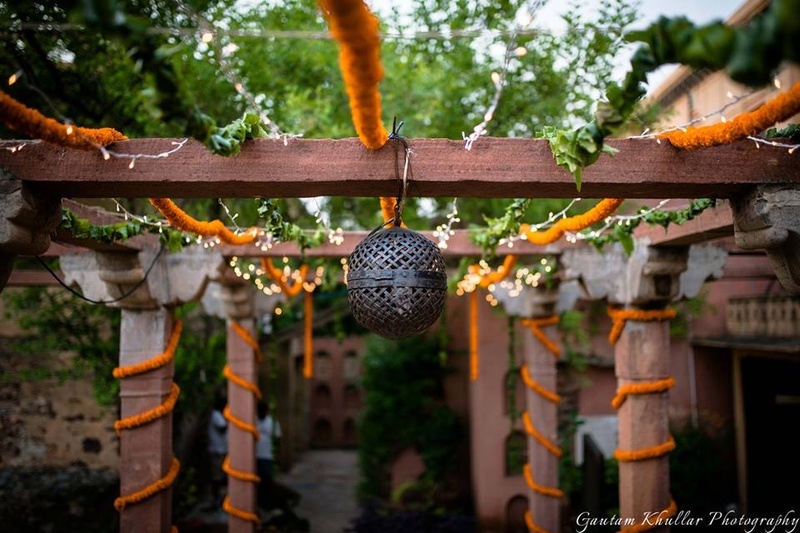 Minimal genda phool decor for the wedding ceremony held at Neemrana Fort Palace. 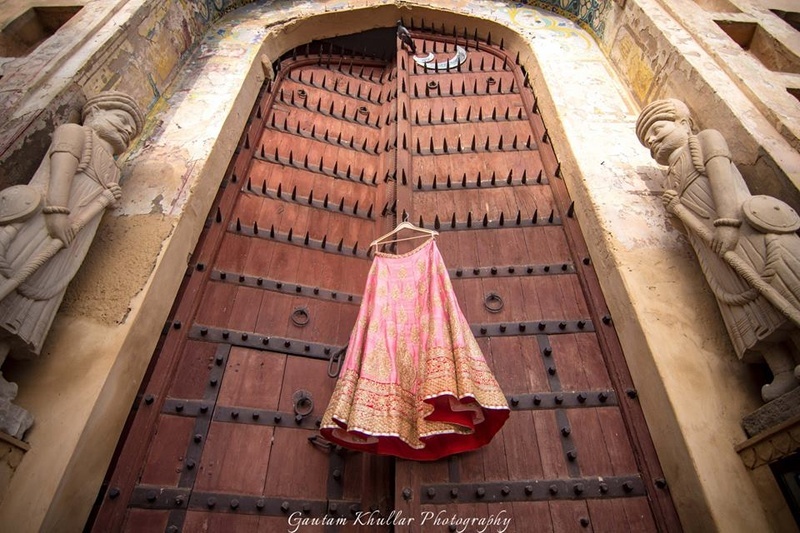 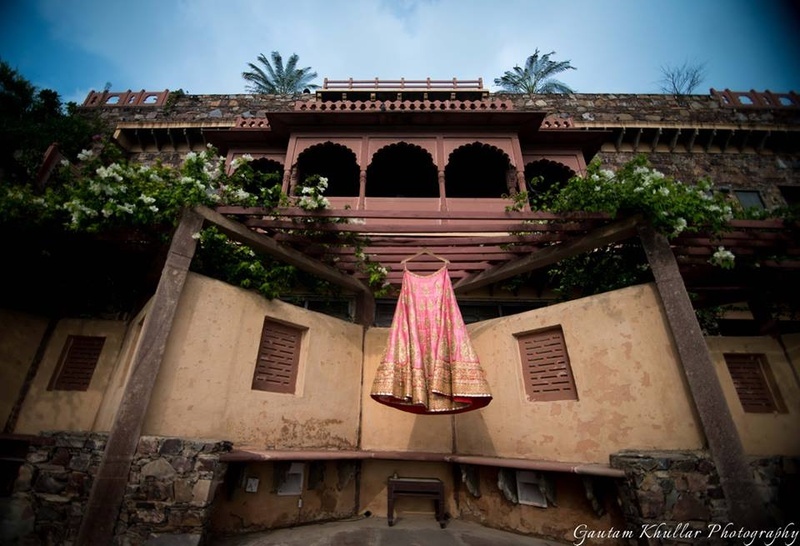 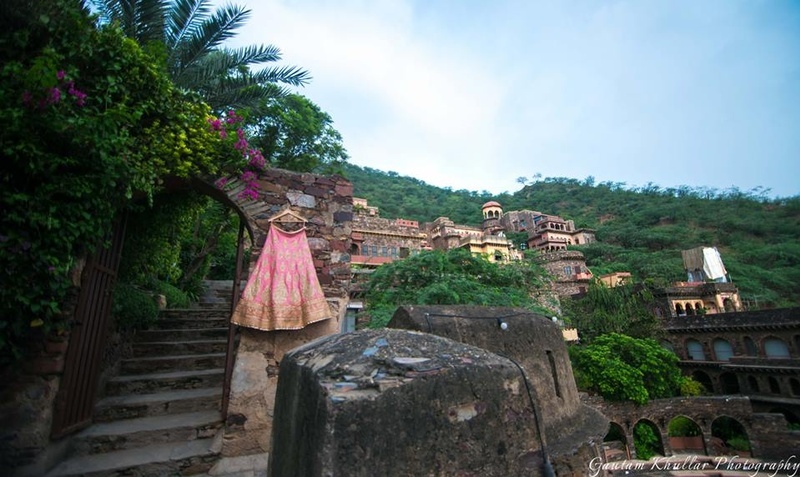 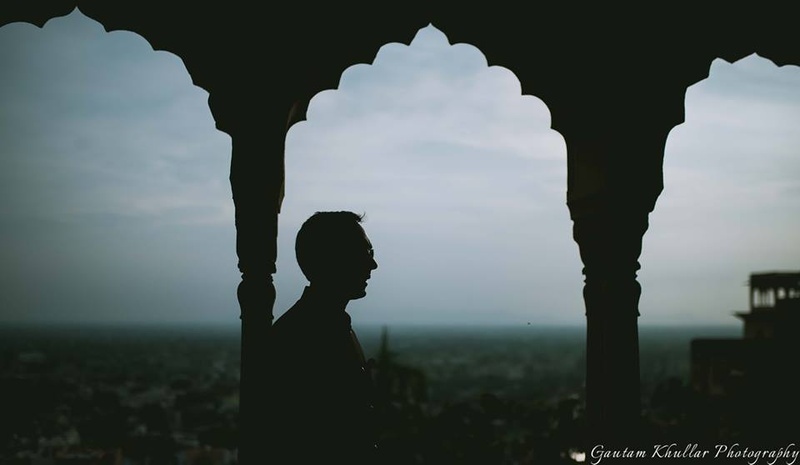 Bridal lehenga photography at Neemrana fort palace location by Gautam Khullar. 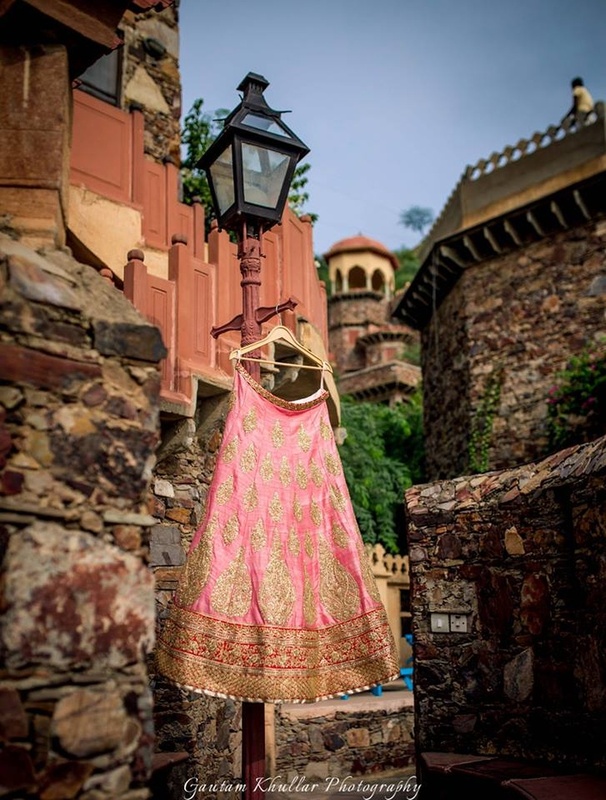 Bridal lehenga by Frontier Raas, Delhi. 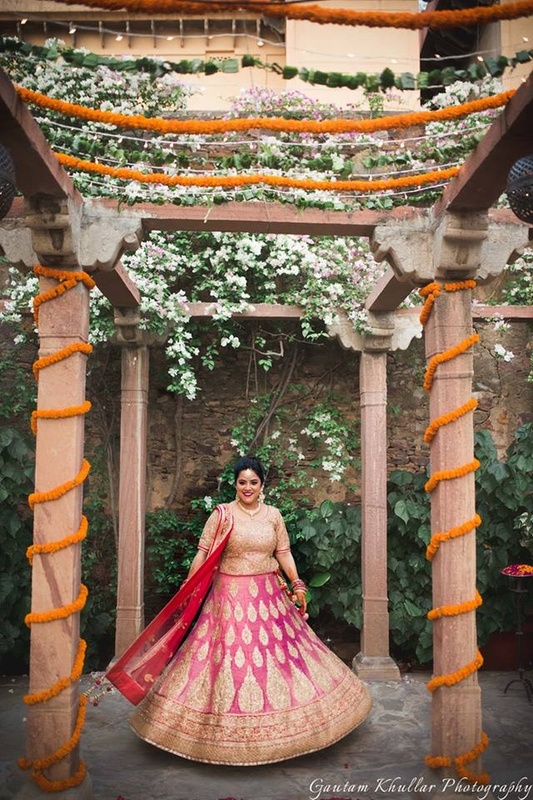 Wearing pink and gold bridal lehenga by Frontier Raas styled with minimal bridal jewellery. 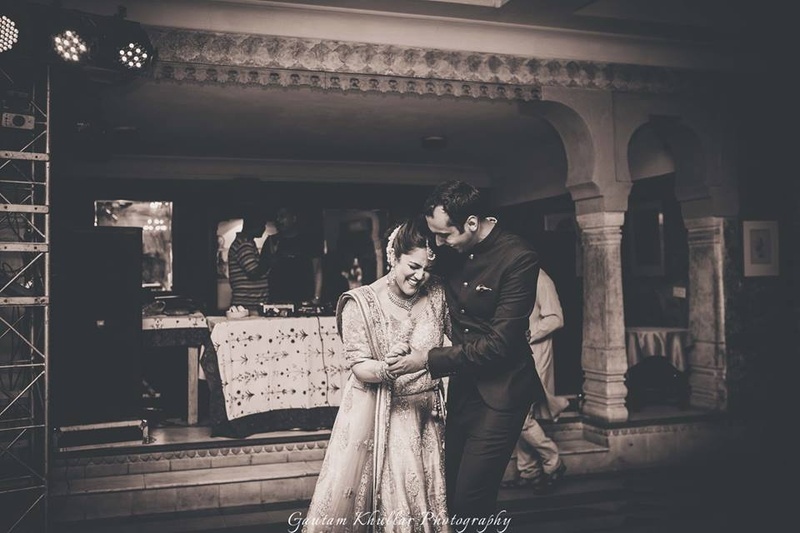 Moumita in pink and gold bridal wear and Sriraj complementing her in total black bandhgala. 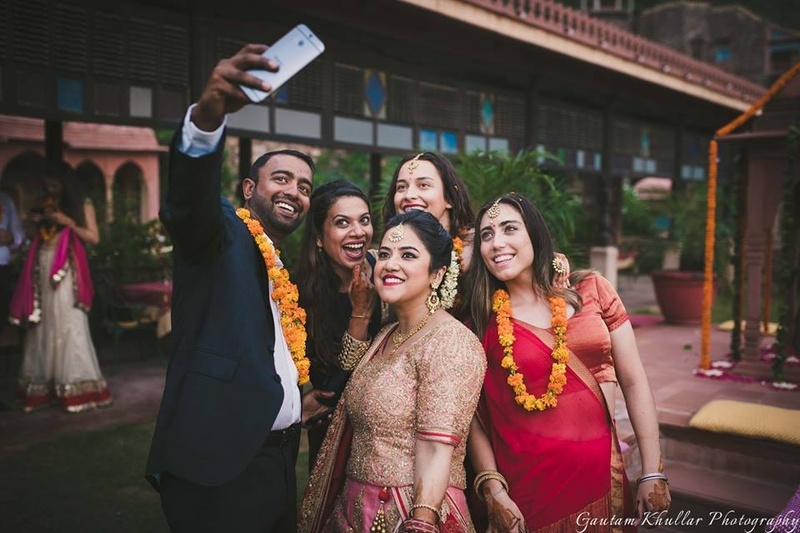 Bridesmaids all ready and excited for the wedding ceremony. 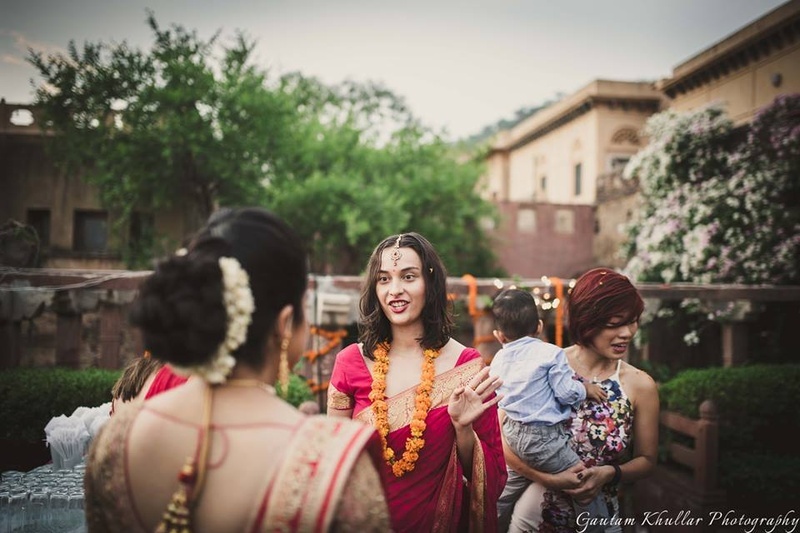 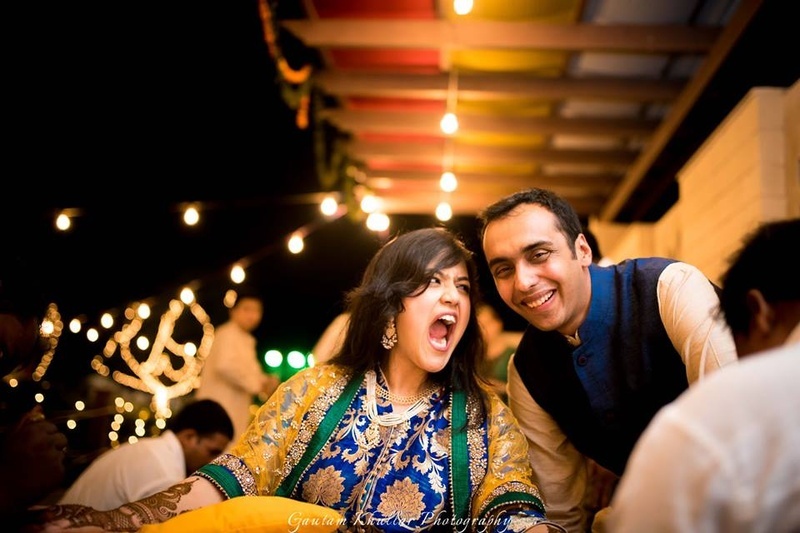 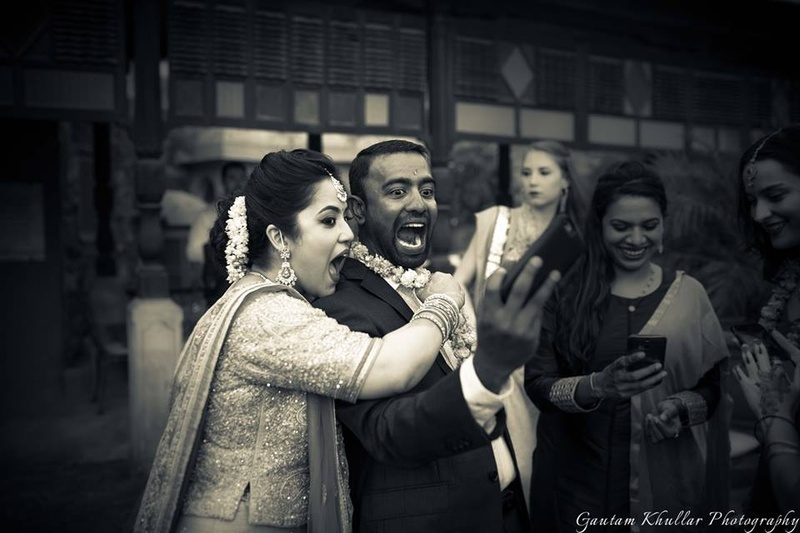 Candid photography by Gautam Khullar. 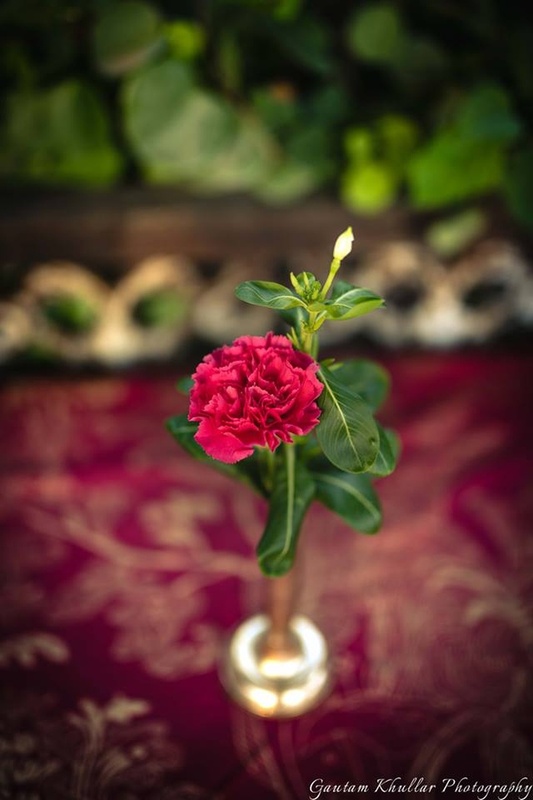 Minimal flower table decor for the wedding day. 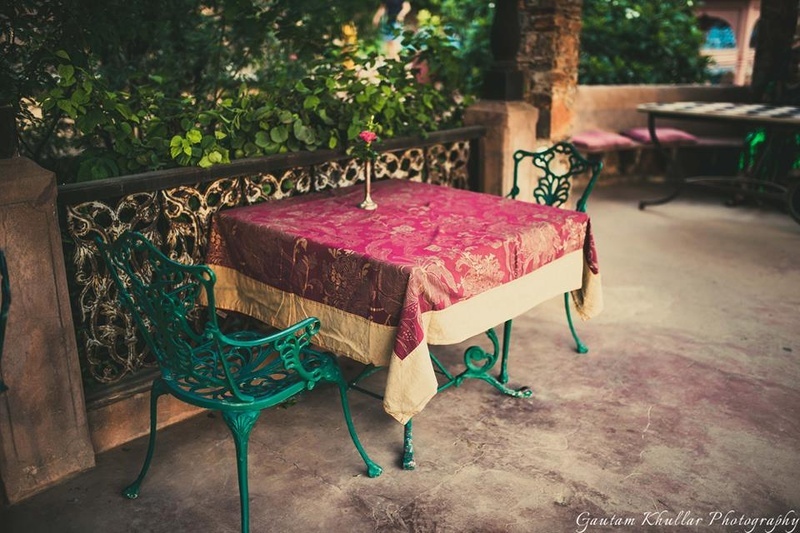 Table decor at Neemrana Fort Palace. 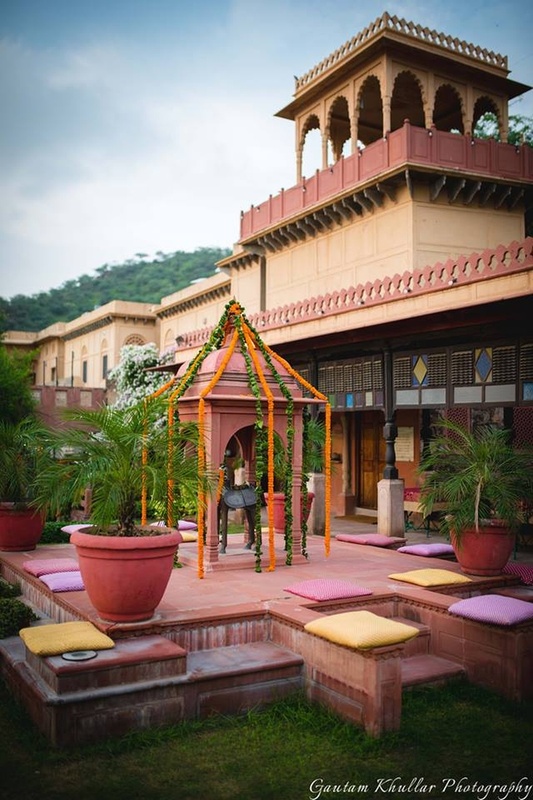 Genda phool decorated around the pillars for a beautiful quaint look. 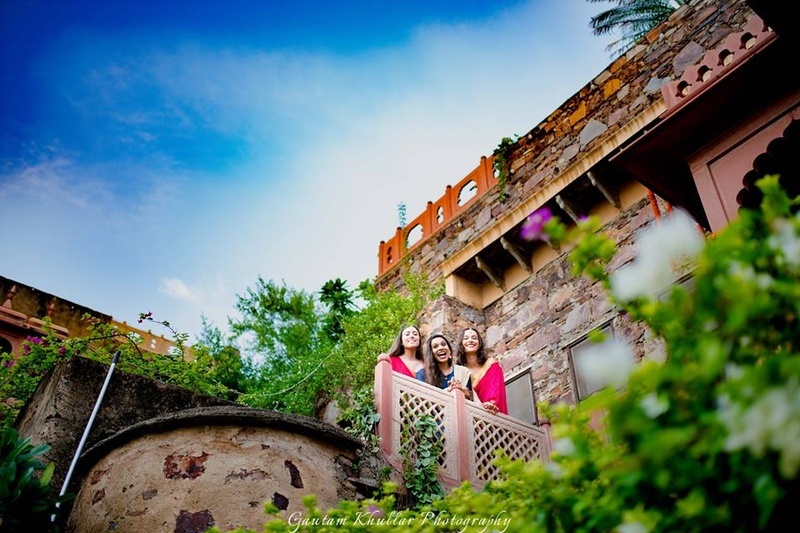 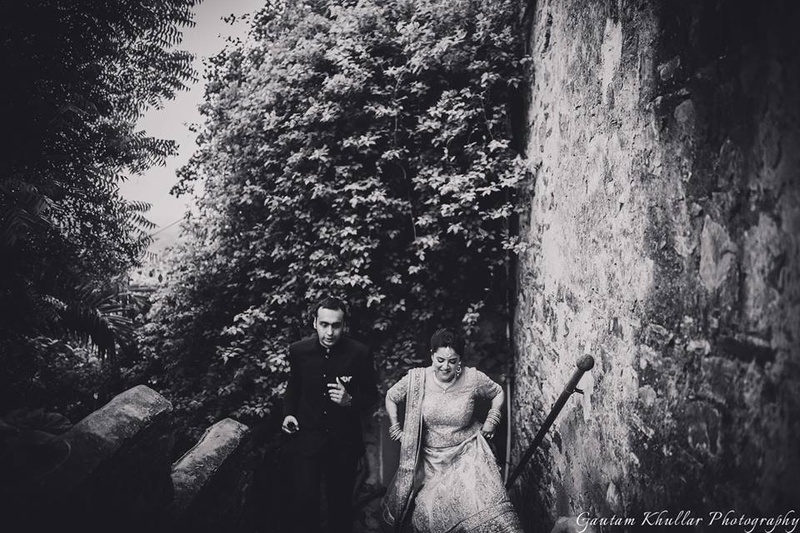 Wedding couple shoot at Neemrana Fort. 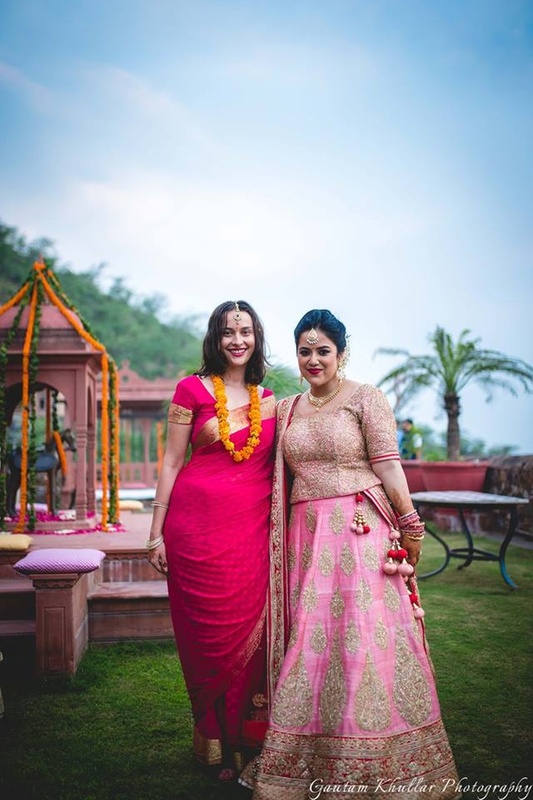 Bride and bridesmaid wearing color coordinated outfits for the wedding ceremony. 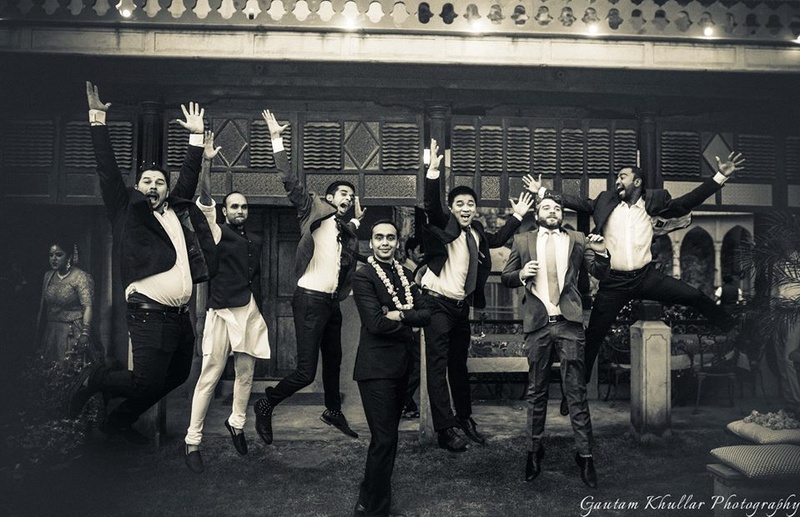 Groom and groomsmen posing for a quirky wedding pic . 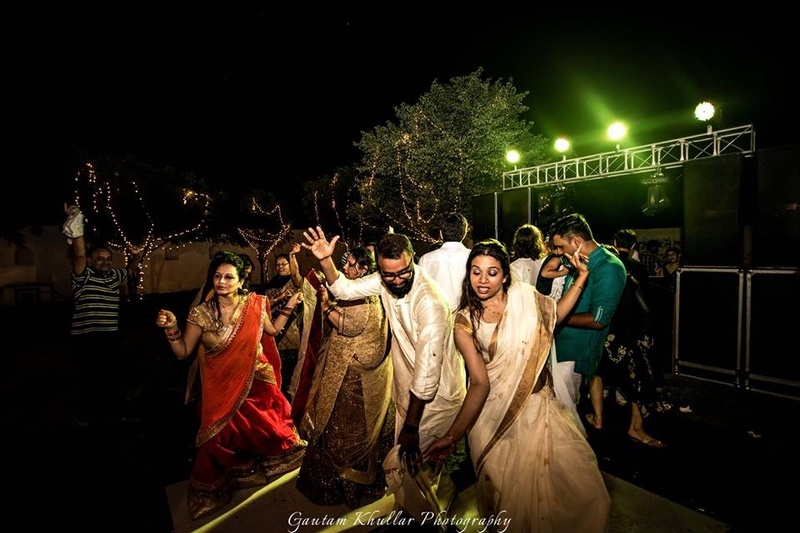 Super cute dance performance by the bride and groom after the wedding ceremony. 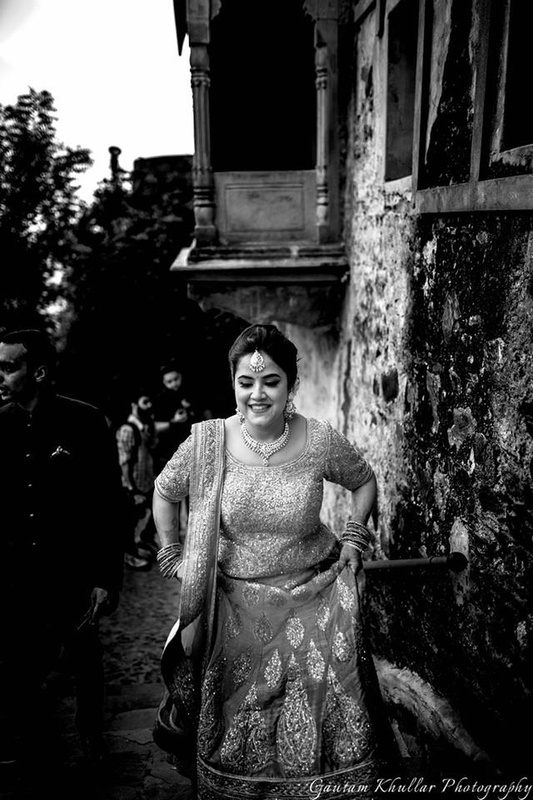 Bridal shot by ace photographer Gautam Khullar.